In London in the first half of the 19th century, cows were kept in sheds and their milk and dairy produce sold from small adjacent shops. The conditions in which the cows were kept were appalling. The were often tethered in small dark stalls, unable to move, which made the cows unhealthy and contributed to the poor quality of their milk. 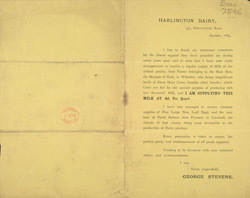 As the century progressed, with the spread of the railways and limited refrigeration, better quality milk could be transported from the countryside on trains and sold in dairy shops like the one featured in this advertisement. Despite this, the last cowkeeper's shop in London did not close until 1953.